Hello friends, as promised, I have a sweet little cat pattern to share with you today. 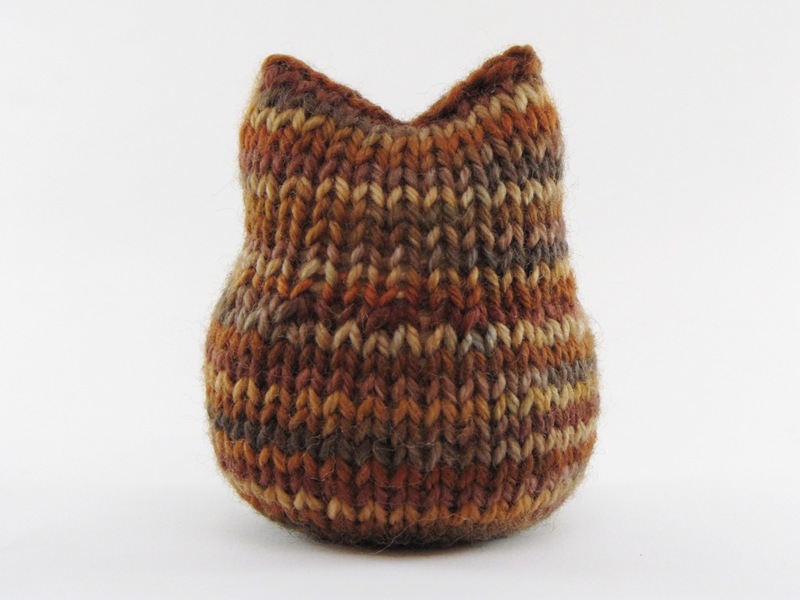 I have knitted him in the round in the Magic Loop but you can also knit him on dpns in the round or knit him flat and simply sew him up at the back, if you prefer to knit on 2 needles. 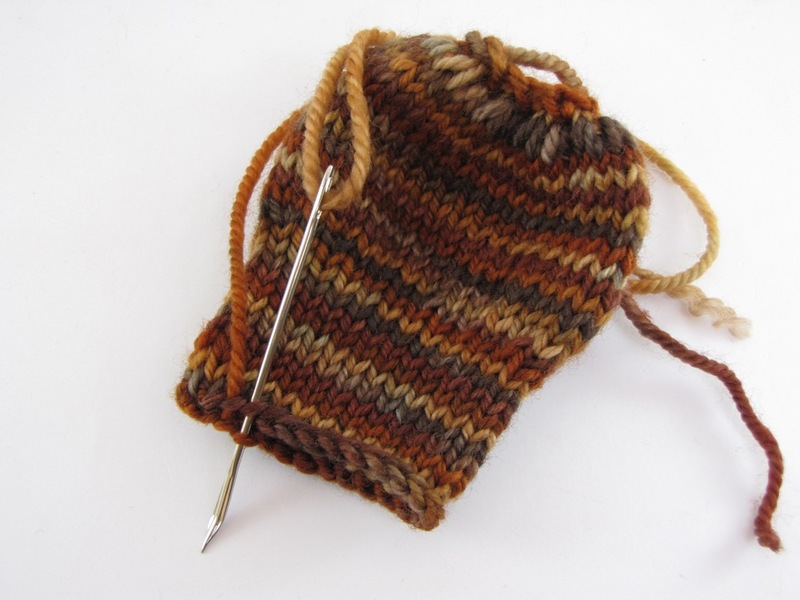 If this is what you would like to do then just knit the pattern in stocking stitch, flat with 2 needles. Hold the top of the cast off edge together flat and sew in and out, closing the top of your cat’s head. Stuff Beans and make him plump! Once you are happy with the firmness, sew around the open base of his body and pull tight to close. Take a needle and wool, sew into the base of Beans, secure the wool and push the needle up through his body and pull it out the top of his head, sew back down again and pull. This is going to make a nice big concave depression that will form his two ears. Once you have sewn back down, pull the needle and wool out the base of the body, pull tight and sew the wool securely onto the knitting, ensuring the depression remains at the top of the head. With a felting needle and some black and pink fleece, needle felt on 2 eyes and a nose. With 2 dpns (double pointed needles) cast on 5 stitches and knit an i-cord for the tail, I knit mine about 5 inches long and cast off. Sew on the tail at the back of Beans to the side so that it can wrap around his body. 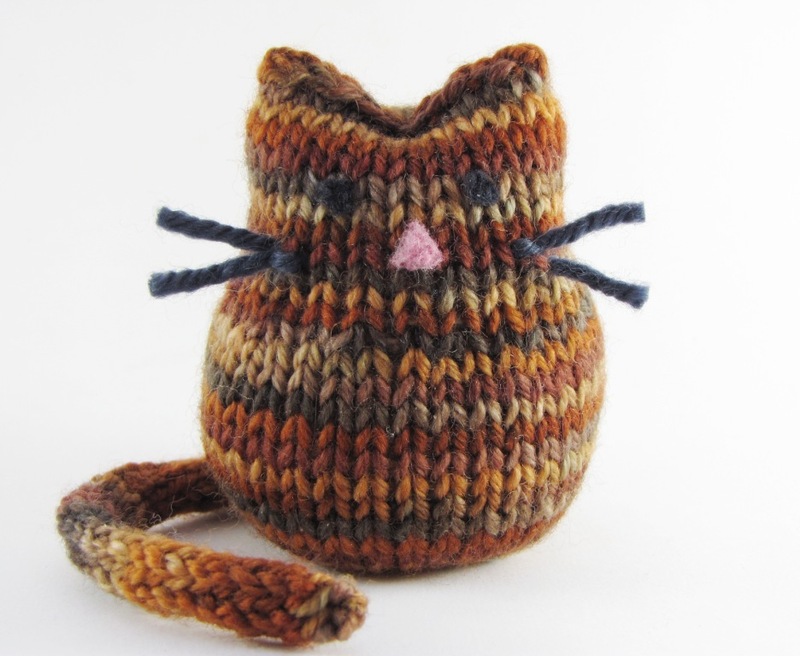 If you would like to add whiskers, just sew some on with a needle and wool in a rug stitch. Another small simple project that will create smiles as well! Thank you! Thank you Linda for another great pattern. The little one here loves cats so I think I will cast on one to surprise her for tomorrow morning. This is so sweet of you to share, have a great day! So cute ang purrrfect! I’ll try! Thanks, might try my hand at this one, you can never have enough kitties can you? oh, that is just too cute! Thanks for sharing!! Oh how cute! (and this coming from a non-cat lover) Thanks for the pattern. This is very cute, thank you for sharing! Oh my goodness, that is so so sweet! Landon would love this :). Thank you for sharing the pattern. I’m having a quiet evening on my own tonight so I think I will make this. That is awfully sweet – and you do not need to get gauge! 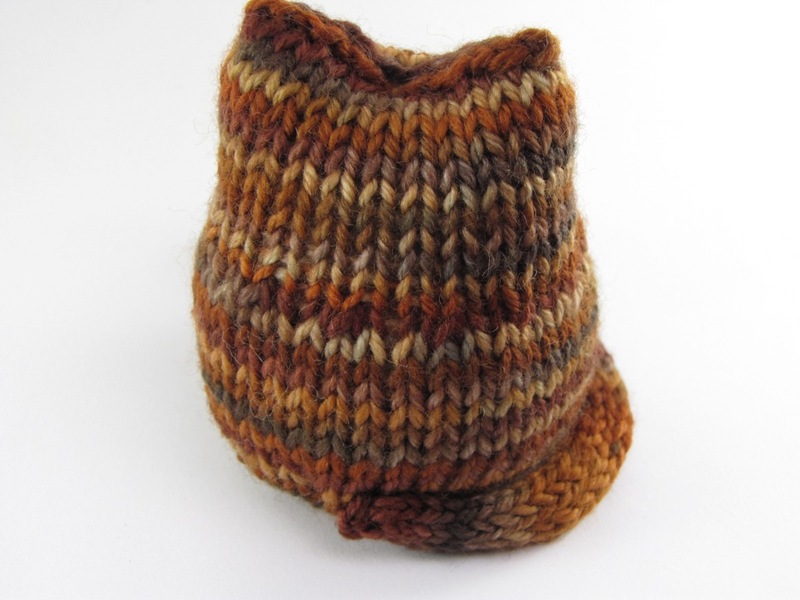 I am planning to teach some girls to knit this fall, and this pattern is perfect. Thanks! Sweet kitty and perfect kitty yarn………item in upper right of header is that a shawl or ………..I like it. Sweet kitty and easily achievable design – Gorgeous. Has anyone actually stuffed Beans with beans? I was thinking of using it as a doorstop. Oh – I was going to TELL you he also looks like an owl. I was too late to be the clever one! He’s sweet and adorable. Oh so cute and simple … love it! I really need the Tour de Fleece to end so I can get back to knitting. Love your cat. He is adorable and soooo easy. Thank you very much for the pattern and tutorial. I will be making a lot of these to put into the Christmas stockings I am making for the women’s shelter here in Edmonton, Canada. I don’t want to sell these, but our local cat rescue (Feline Rescue in St. Paul, MN) where we got two of our three cats is having a holiday boutique to benefit the shelter. May I please have permission to knit these to donate for the auction? Only the Feline Rescue will benefit, I promise! This is such a cute kitty. Thanks for sharing the pattern. Hi there! I’ve never done felting before, and I’m wondering if you can give me a few quick tips about how to felt the nose and eyes onto the finished project? You just need a felting needle and some black fleece. If you have a look on the internet, there are many tutorials. The needle has little barbs on the end of it and as you push it into the fleece, it binds the fleece to the knitting. OMG, my friend sent me this URL the other day and I about died over how cute this cat is. And I happen to have quite a bit of yarn in this weight that I don’t have anything to do with at the moment, so I think people are getting Beans for Christmas. 🙂 I’ve seen other little things like this that are persnickity and hard to do – I was pleasantly surprised that this little guy is actually as easy as he looks to make! I tend to do a 3-needle bind-off for the head, rather than binding off in a circle and then sewing it up – because I’m lazy. 😉 Works like a charm, though. I’m also leaving a long tail when I cast on and using that to first sew up the bottom and then swing up and over the top to make the ears – loving how that works. Thank you so much for sharing this pattern! Thanks! I just finished the body – love the pattern 🙂 I’m going to add some catnip to the stuffing and make it a cat toy. I love how the one I made came out, I used some very bulky chenille, put two oriental chime balls in with the stuffing and also added legs. This was absolutely amazing! I made it for my love as an extra christmas gift since he loves cats! I made him blue but this is an absolutely awesome pattern. Thanks so much! Thankyou so much for the pattern, I only knit for my local hospital childrens ward and Special care baby unit, preemie hats and cardigans mainly. Just rediscovered this and put it on my “to do” list! I have another project to finish and this gives me incentive to work fast. This kitty is super cute,I am making it for a friend who just lost her kitty, this will be comforting for her,thanks alot. OK, how do I join TEN cast on stitches? 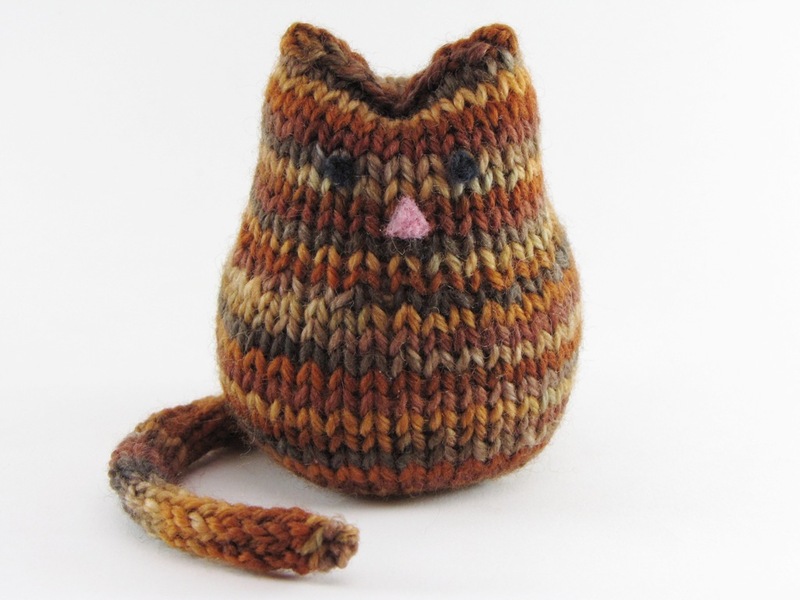 Hi, One of my teenage boys’ cat was killed at Xmas so I made him your knitted cat. I hope he likes it, I’m sure he will, it’s pretty cute. Thanx. Magnifique!!!!! Je découvre ton blog et j’adooooooooooore!…. this is so cute… and i appreciate the way you specify how to use other styles. i for one prefer to use 2 needles… thanks for the pattern and instructions. Hi Stephanie, I’ve knitted Beans in the magic loop technique. 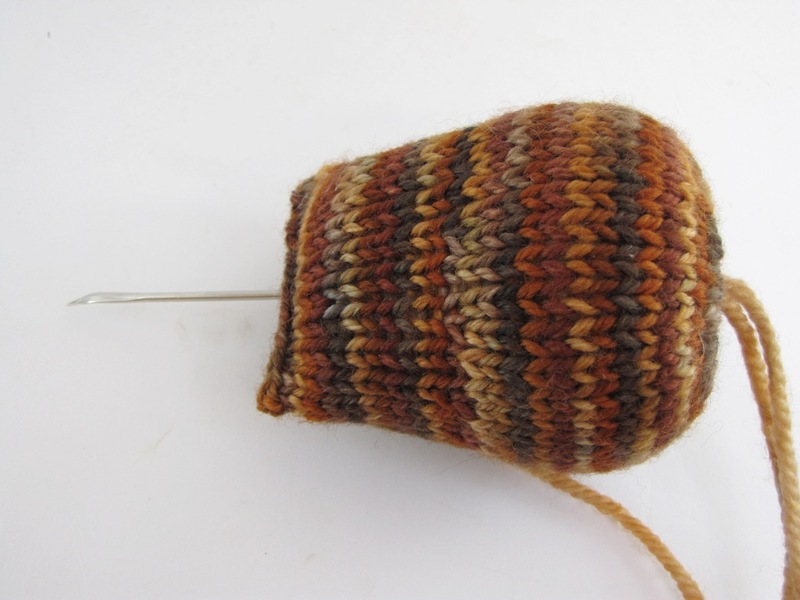 You can google Knit Picks Magic Loop Tutorial, a tutorial will come up and explain exactly how to go about it. If this is done flat, how is round 16 done (since you can’t k2tog across the non-existent join)? It’s a super-cute pattern, thanks for sharing it! You recommend needle felting the eyes and nose. Would this stay on well enough for a baby toy? merci beaucoup pour ces explications !!! il est très mignon !! Looks wonderfully cute. I’d really like to make him but the last 2 pictures have gone for a walk. Any chance you could refresh the site. I will attempt to fix these missing photos now. I agree — what a sweet little cat! Hi I like Beans the cat. I can’t find the size of him anywhere, but withno mention of balls of yarn, I think he is too small for what I want. I have seen a pattern for another cat, (brownie the cat) but I like the colour beans is made in. Where do I find this yarn – is it expensive? Could you also tell me how to get the pattern of Brownie? I have clicked on it. It is in Etsy or Pinterest, and I haven’t got anything from them before. I have been looking for the pattern and yarn for months. It is for a friend – an old lady.